Premio's Industrial GPU Computer is the ideal solution for Machine Vision, Edge Computing, Traffic Vision, Telemedicine, Intelligent Control, Deep Learning, Artificial Intelligence, Voice Recognition and any application workloads requiring intensive processing parallelism and performance driven analytics for Industry 4.0/IIoT applications. What is an Industrial GPU Computer? 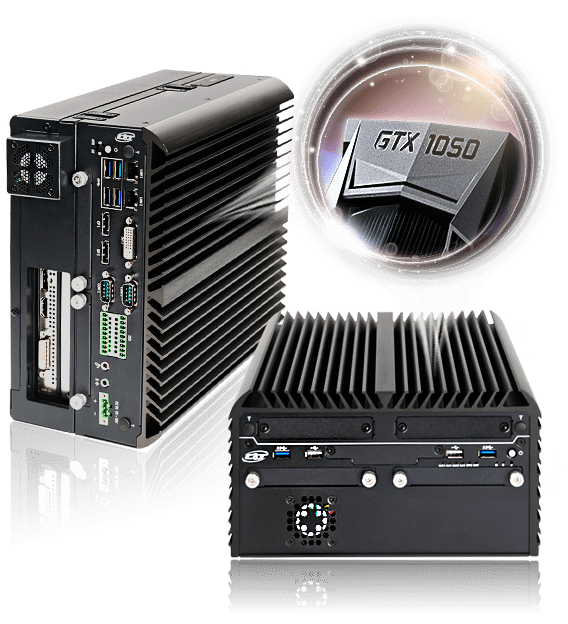 An Industrial GPU computer is a rugged, edge computing solution that utilizes a dedicated GPU (Graphics Processing Unit) card for computational intensive applications requiring advanced image processing and machine vision/intelligence. 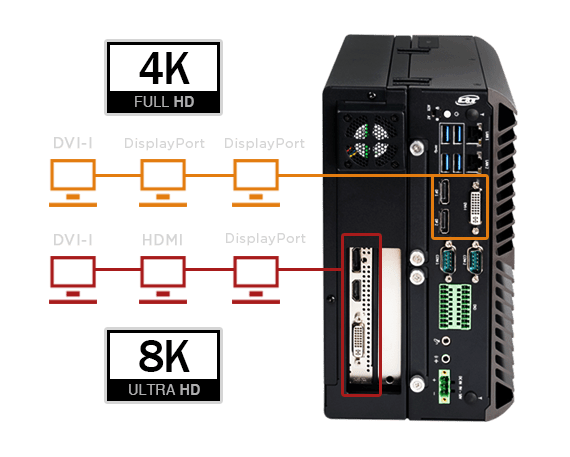 In addition to a performance boost from the GPU, an industrial GPU computer will also have all the key requirements of what makes up an industrial computer, such as support for high shock/vibration ratings, wide operating temperatures, and over voltage/reverse polarity protection. The industrial GPU computer is transforming how factory automation and smart manufacturing verticals are utilizing computational analysis and machine intelligence in real-time. Where do industrial GPU computers fit? How does an industrial GPU computer work? Both GPUs (Graphics Processing Unit) and CPUs (Central Processing Unit) have many traits in common; they are both specifically designed microprocessors to handle various tasks. The key difference is HOW they process these tasks. In a computer, the CPU is often referred to as the brain of the system; it is the central processing unit which handles all computing tasks. A GPU, while similar to a CPU, is engineered specifically to process or render graphics. As such, a GPU can work in conjunction with the CPU to help it offload graphics intensive tasks, while freeing up the CPU for other non-graphics related jobs. The CPU is ideal for serialized, generic tasks, which makes it well-suited for common business or productive applications such as Word, Excel, or a web browser. The number of cores in a given CPU is limited, up to 28 cores for the latest Xeon server class CPU. Conversely, the GPU comes with hundreds or even thousands of cores, which is designed for parallelized, specific tasks; the GPU is optimized for intensive computational applications such as image processing or AI. As an example, let's examine the fundamentals of image processing. The 4K image of the clock consists of 8.2 million discrete pixels (4K resolution is 3,840 x 2,160, which gives us 8.2 million pixels). From a high level, in order to process the image, we will need to perform some type of computation to each individual pixel. If this task is given to a CPU, with its limited number of cores, the processing time will take very long, as the CPU does not have enough cores to handle the task in parallel. The GPU, which its thousands of specialized cores, can complete the task up to 50-100X faster due to its parallel architecture. This makes the GPU the optimal microprocessor to handle tasks that require parallelism with a high degree of computation. We begin with a proven embedded system that is engineered to withstand extreme shock and vibration, along with a wide operating temperature range; the inclusion of an industrial class GPU will enable the system to operate reliability in industrial/manufacturing sectors, with the GPU handling AI or image processing applications that require massive parallelism. One way to compare the performance of various GPUs is by their TFLOP rating. TFLOP stands for "teraflop," which is a measurement of the GPU to performance one trillion floating point operations per second. By adding a GPU to an industrial system, another critical variable we need to consider is the TDP (Thermal Design Power) rating of the GPU. The TDP rating tells us the maximum heat, in watts, generated by the GPU when operating at maximum capacity. This is key in determining the operational temperature range of an industrial GPU system, which should be optimally in the range of -25C to 60C for factory/manufacturing averse conditions. By looking at the Performance versus TDP chart below, we can see the direct correlation between these two values: as the GPU performance increases, so does its corresponding TDP value. When designing an industrial GPU system, there is a fine balance to strike between GPU performance versus overall system operating temperature. Premio GPU Computing Systems are built on the highly efficient NVIDIA® Pascal™ architecture featuring 4GB GDDR5 and 768 CUDA® cores that delivers amazing performance with impressive power-efficiency. The GTX 1050Ti features 1.73 TFLOPS with a max TDP of 75W, making it the best fit for industrial computers that require optimal performance and wide range operating temperature. Through combining discrete NVIDIA GTX 1050Ti and integrated Intel HD Graphics units, Premio GPU computers enable support for up to 8K resolution and six independent displays. Flexibility and performance are packed into a robust and durable design for incomparable user experience. Premio GPU computing systems go through a rigorous design cycle with strict quality assurance procedures and extensive product testing. These industrial computers are the ideal solution for versatile operations in rough and harsh environments.